Reset oil service light Saturn SL1. From year: 1996, 1997, 1998, 1999, 2000, 2001, 2002. How to reset oil service light Saturn SL1. Switch ignition to Run/On, without start the car. You must open your car hood. Remove the fuse block cover, as you sit with your face to engine the cover is situated on right beside the battery, on the cover have this info list, picture below. 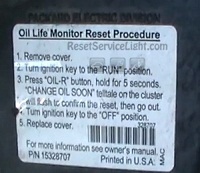 After that depress and hold for about 5 seconds the button OIL-R which means oil reset. See picture below. 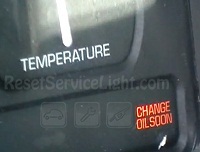 The Change Oil Soon maintenance light will flashing, you most wait until the maintenance light will stop blinking. Switch ignition OFF and then start the car to see if Change Oil Soon maintenance light is gone. That it is the full procedure how to reset oil service light Saturn SL2. If you like to reset any maintenance oil light after an oil change. Or reset check engine light, airbag light, inspection key or insp errors when maint reqd, for Saturn cars. Or any warning light for service reminder which appears on the display. Write in the search box the car name for which you want to find information, and find how to reset other service reminders by yourself. Read here where to locate and how to replace Saturn SL2 fuel filter. I did changed the oil….but the service light with a wrench still there…..I was told un plug the battery, play with the ignition on and off reset the mileage button and press the gas and brake pedals…..in the fuses box if not button to press…..any advice..? Please tell me what car do you have in what year was made ? NO BUTTON TO PRESS IN THE FUSE BOX OF MY SATURN SL2 ,3.0 6 CIL , ? HOW I CAN DO THE RESET ? Hello, please tell me from what year is your car?